The Communal Illusion | Digitalestate Inc. 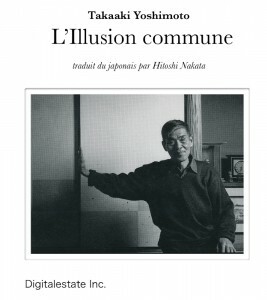 The French version of “Communal Illusion” of Takaaki Yoshimoto is published by EPUB and Print on demand (paper book). Click on the cover picture to go to the Amazon site. Please enjoy “Osaka Castle-the gold tea caddy disappeared” in preview. This overview has let me use theBiB/i（EPUB READER on your Website）Satoshi Matsushima, thank you. The common Illusion published in 1968 two years after the publication of his first chapter of the taboo in the magazine Bungei gave a great blow especially to students who sought in vain to arm themselves with some effective theory when they were then precisely In the universal agitation to the world dimension under the intensification of the Vietnamese war, while waiting for us the year 1970 the tenth anniversary and the renewal of the security treaty with the United States. But as every theory always comes too soon or too late, the author’s reflections did not seem to be understood at that time. He writes, however, articles to comment on current issues in Shiko, a journal founded by him in 1961, by which he communicated his judgments to minority readers. The movements of students who had then seemed to engage the whole nation were decomposing more and more in two poles of the stagnation of large part and extremism of small number after political events: the riot in the conference room in University of Tokyo in winter and the interruption of its entry examination in the spring of 1969, the hijacking of a Japan Air lines aircraft by the Red Army (sekigun) and the invasion of the Japanese defense by Yukio Mishima and his suicide by hara-kiri in 1970 and the fire fight at a mountain Asama cottage between the Associated Red Army (rengo-sekigun) and the police force in 1972. Yoshimoto had an interview with Michel Foucault on the subject of the method of world perception in Tokyo in April 1978, after ten years of publication of the book. He pointed out to us the arrival of the high season when we could discuss the Common Illusion finally at the academic and international level. The reading of this interview let us know, however, that the discussion is going round in circles until the end. That is the logic of things. For Yoshimoto could then read almost all the works of Foucault translated into Japanese, while Yoshimoto could not read any word of Yoshimoto by any Western language. At the end of the interview Foucault wished Yoshimoto to be translated into French, if not in English. Then, after ten years, I finally finished the french translation, publishing it in the university Bulletin, but I thought that this translation was only an offering at Foucault’s grave. Then I “published” in CD-ROM format by Voyager ExpandedBook in 1996, but it could not sell itself unfortunately only in Japan. In 2013, on the occasion of the university’s retreat, I established a publishing house to publish the digital book of the French version of “L’illusion commune”. In addition, I arrived at the print-on-demand publication in 2016. 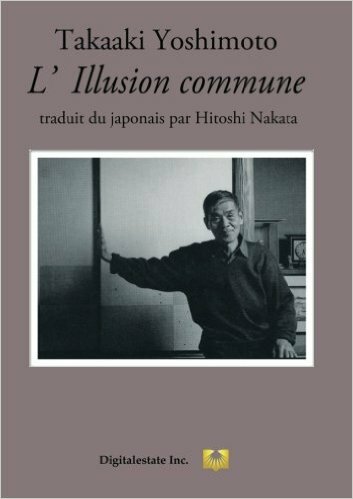 The time finally arrived where the masterpiece of Takaaki Yoshimoto, original Japanese thinker reads all over the world in French. To the world of beautiful reverie. Kunio Yanagita wrote these verses when he was a poet of the New Style. This young poet, a member of the magazine “Kokumin no tomo” (the Friend of the People), in the words of Konosuke Hinatsu, “advanced towards the highway of his science without any trace of poetic devotion” He had so much talent that Doppo Kunikida had recommended it. But was the scientific system of Yanagita really the change of direction of these verses? “When I woke up in the evening”, this expression seems to symbolize his mentality: it was not the one where he worked under the light of the noon, awakening at dawn, after he had Advanced in ethnology, but it resembled that in which he wandered seeking the symptoms in the twilight, awakening in the evening. The mentality that resembles a boy’s wish to still plunge into the state of hypnosis at the moment when it was already dark in its surroundings when it awoke, symbolizes the way in which it sank to the ‘ethnology. Yanagita’s ethnology seems to have expanded her investigation throughout the passion of her song: “Come, let me come once more, to the world of beautiful reverie.” It never stops, rising from Sleep in the evening, to do the logical analysis to the dark tales. His ethnological system resembles the current which follows the narcotic hallucination, half awakened or half-drowsy, in the evening darkness. And it is indeed to the common illusion produced by the obscure sensibility, running in the villagers, that the anagita was held fast by the Tales of Tôno. Before considering the phase of this common illusion, let us look at the nostalgic episodes described by Yanagita on his natural qualities of his childhood. Three or four years later [this event], my mother, two brothers and I went to collect the mushrooms in the hill that we saw every day from afar. In the valley on the other side there was a dark and sad pond on the side of which we descended and we rested for the moment. At sunset, looking for the mushrooms again, we went up the same road to the entrance of the hill, we believed it, yet we do not know how to stroll, we returned again to the edge of the sad pond. I felt stupefied at that time, but I was suddenly suddenly when my mother scolded me in a loud voice. If I had been lonely then, I would have left an example of kidnapping. Click on the icon below, to go to the page of the site. You can buy the original Japanese Paperback Version here and Kindle version here.